Digestive enzymes dreaks down fats, carbs & protein, and maximizes assimilation. It also optimizes nutrient uptake. 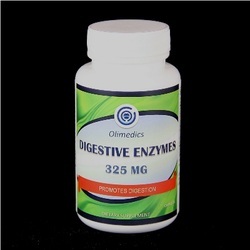 This product is a comprehensive blend of enzymes that support healthy digestive functions. Take 1 to 2 capsules before each meal or as directed by a healthcare professional. Do not exceed 6 capsules daily. This product is manufactured and packaged in a facility which may also process milk, soy, wheat, egg, peanuts, fish and crustacean shellfish. KEEP OUT OF THE REACH OF CHILDREN. DO NOT USE IF SAFETY SEAL IS DAMAGED OR MISSING. STORE IN COOL, DRY PLACE. Active ingredients: Pancreatin. Includes amylase, protease, and lipase. Other ingredients: Microcrystalline cellulose, gelatin (bovine), vegetable magnesium stearate and silicon dioxide.